Punakaiki is the gateway to the dramatic limestone country of the Paparoa National Park. It lies halfway between Greymouth and Westport on one of the most spectacular coastal highways in New Zealand. The Punakaiki township has a Paparoa National Park Visitor Centre, café and tearooms, craft shop and plenty of car parking. The surrounding area is scattered with accommodation – upmarket hotel apartments, boutique bed & breakfasts, self-catering motel units, a campervan and camping ground, and backpacker accommodation. Tourism activities include canoe adventures, horse trekking, knifemaking and cave rafting to name just a few. 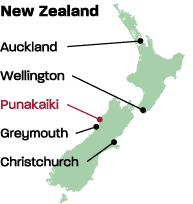 Punakaiki has many colourful local crafts people – jewellers, carvers, painters and potters. 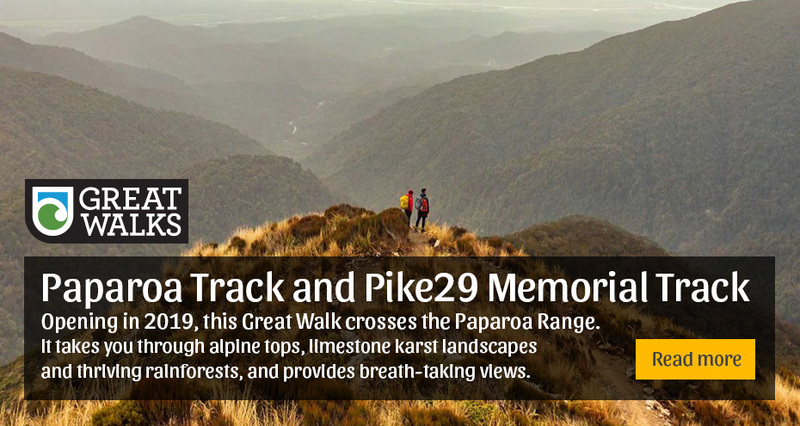 Within a few minutes drive of the Punakaiki township are many walks for various fitness levels – take a 10 minute stroll along the beach or equip yourself for a overnight trip into the heart of the Paparoa National Park. The seabed was raised above sealevel by earthquakes to form the coastal cliffs and coastline. The sea, wind and rain have since etched out the soft layers to form the unusual rock formations we see today. When conditions are right, heavy ocean swells thunder into the caverns beneath the rocks and huge water spouts blast skywards through the blowholes in a truly spectacular sight. Punakaiki is located near the centre of the “Coast Road”, one of the most spectacular coastal drives in the world. The roads are well sealed all the way. To allow time to stop and enjoy some of the walks and coastal views, we recommend allowing much longer than the drive times given in most travel guides. 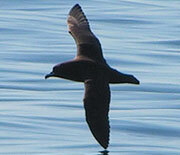 The Westland Petrel (tāiko) is endemic to New Zealand and breeds only on the West Coast of the South Island. It can be viewed at dusk in the winter months. The Weka or “woodhen” is a flightless bird, native to New Zealand. About the size of a chicken, they have a bold curiosity, and a cheeky reputation for stealing shiny objects which they use for nest building. South Island Weka are inquisitive birds, often seen around huts and human activity trying to bludge food. They’re fast runners, being a member of the Rail family, and can live for up to 15 years. Their feathers range in colour as a mixture of black, dark and light browns. Early South Island Maori and European settlers hunted Weka for food and oil. Maori also used their feathers for cloaks. The New Zealand Fur Seal or Southern Fur Seal, frequents the beaches and rugged Punakaiki coastline. ‘Kekeno’ in Maori, can be identified by their pointy noses and long pale whiskers. They have small visible ears and their bodies are covered in a dark grey-brown on their backs, with lighter fur underneath. Often spotted sunning themselves during the day, they hunt for food at night. While walking along some of the Punakaiki coast, you may see them although their colouring camouflages them well amongst the rocks. Fur Seals may appear a little awkward when moving on land, but once underwater they’re graceful swimmers. Seal pups are particularly energetic, playing with other pups and objects such as seaweed and reef fish. 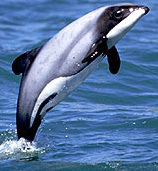 One of the smallest marine dolphins in the world, Hector’s dolphins grow no more than 1.5 m in length.